Over a lifetime, the various parts of the brain that control the body's movements can suffer damage from various causes, such as head injuries, strokes, and degenerative brain diseases. One typical example is what happens when one side of the motor cortex is completely destroyed by a stroke. Because of crossed control, this centre normally controls the voluntary movements on the opposite side of the body. With this centre destroyed, no further motion is possible; that side of the body becomes completely paralyzed. All of the body's voluntary movements are controlled by the brain. One of the brain areas most involved in controlling these voluntary movements is the motor cortex. 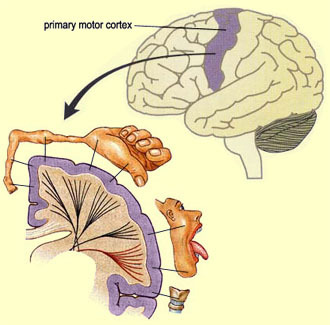 The motor cortex is located in the rear portion of the frontal lobe, just before the central sulcus (furrow) that separates the frontal lobe from the parietal lobe. 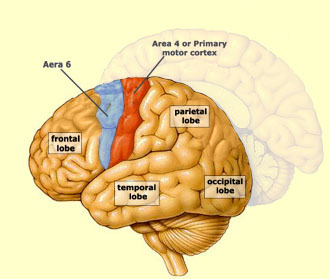 The motor cortex is divided into two main areas, Area 4 and Area 6. Area 4, also known as the primary motor cortex, forms a thin band along the central sulcus. Area 6 lies immediately forward of Area 4. Area 6 is wider and is further subdivided into two distinct sub-areas. 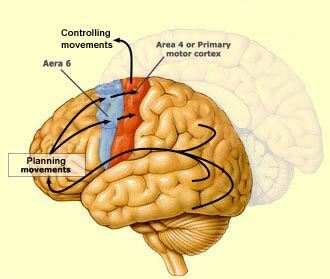 To carry out goal-directed movements, your motor cortex must first receive various kinds of information from the various lobes of the brain: information about the body's position in space, from the the parietal lobe; about the goal to be attained and an appropriate strategy for attaining it, from the anterior portion of the frontal lobe; about memories of past strategies, from the temporal lobe; and so on. In 1870, Hitzig and Fritsch electrically stimulated various parts of a dog's motor cortex. They observed that depending on what part of the cortex they stimulated, a different part of the body contracted. Then they found that if they destroyed this same small area of the cortex, the corresponding part of the body became paralyzed. This is how it was discovered that every part of the body has a particular region of the primary motor cortex that controls its movement. But what is remarkable about this "motor map" is that certain parts of the bodythose that can make the finest movementstake up much more space than others. These parts of the body are shown larger than the others in the illustration here. The putamen and the caudate nucleus are traversed by the myelinated axons of the internal capsule. These bundles of white matter form stripes that distinguish them from the grey matter of the nuclei that they traverse. That is why this group of neural structures taken together is often referred to as the corpus striatum, or striped body. Likewise, the shape of the putamen and the globus pallidus recall that of a lens, which is why these two nuclei together are known as the lenticular nucleus. As their name suggests, the basal ganglia consist of a set of neural structures buried deep inside the cerebrum. The main basal ganglia are the caudate nucleus, the putamen, and the globus pallidus. These ganglia, or clusters of nerve cells, are tightly interconnected. They also receive information from several different regions of the cerebral cortex. Once the basal ganglia have processed this information, they return it to the motor cortex via the thalamus. One of the likely functions of this loop, which operates in conjunction with another one involving the cerebellum, is to select and trigger well co-ordinated voluntary movements. This role of the basal ganglia in initiating and regulating motor commands becomes clearly apparent in people whose basal ganglia have been damaged, such as patients with Parkinson's disease. These patients display difficulty in starting the movements they have planned, as well as trembling and slowness once they do begin them. 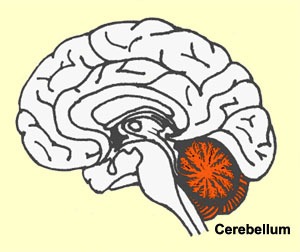 The cerebellum is composed of a number of lobes and lobules which, like the convolutions in the cerebral cortex, increase the surface area of the cerebellar cortex considerably. This large surface area of grey matter provides the cerebellum with a very high density of neuronsso high that the cerebellum, which accounts for only about 10% of the brain's total volume, accounts for over 50% of its neurons! 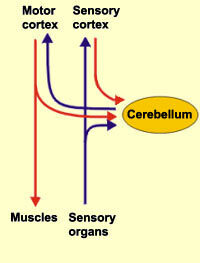 The cerebellum's anatomical location helps us to better understand its functions. It lies parallel to two main neural pathways: one that carries sensory messages to the part of the brain that analyzes them, and another that emerges from the cortex and descends to the muscles to make them contract. The cerebellum thus receives a copy of all the information that is sent up from the sensory organs to the sensory cortex and all the information that is sent down from the motor cortex to the spinal cord. The cerebellum also receives information from many other areas of the cerebral cortex and the sub-cortical regions of the brain. For you to perform even so simple a gesture as touching the tip of your nose, it is not enough for your brain to simply command your hand and arm muscles to contract. To make the various segments of your hand and arm deploy smoothly, you need an internal "clock" that can precisely regulate the sequence and duration of the elementary movements of each of these segments. That clock is the cerebellum. As so often in neurobiology, to understand exactly what the cerebellum does, we can observe patients in whom part of this structure has been destroyed (by a tumour or a stroke, for example). When these patients try to grasp an object, their hands start moving late, advance unsteadily, and either stop before reaching their target, or, often, accelerate past it. In terms of posture, people with damaged cerebellums characteristically display balance problems similar to those found in people who are drunk. In fact, the clumsiness that accompanies excess consumption of alcohol is directly related to its depressive effects on the activity of the cerebellum. In a healthy person, the cerebellum first receives information about the intended movement from the sensory and motor cortexes. Then it sends information back to the motor cortex about the required direction, force, and duration of this movement Thus this loop involving the cerebellum operates in addition to the loop involving the basal ganglia to regulate the details of motor control. Another metaphor summarizes the role of your cerebellum rather well: it acts like an air traffic controller who gathers an unbelievable amount of information at every moment, including (to return to our original example) the position of your hand, your arm, and your nose, the speed of their movements, and the effects of potential obstacles in their path, so that your finger can achieve a "soft landing" on the tip of your nose. The production of movement is organized into various levels of control. At the highest level, the cortex controls voluntary movements. These are all the movements that require co-ordination and precision to adapt to particular situations on the basis of information provided by the senses. At the most basic level, movement is controlled by the spinal cord alone, with no help from the brain. The neurons of the spinal cord thus take charge of reflex movements as well as the rhythmic movements involved in walking. Between these two levels, there are all other kinds of movements. For instance, like the movements involved in walking, the movements involved in breathing have an automatic component but can also be altered voluntarily (for example, if you want, you can hold your breath, just as you can run instead of walk). The basic function of the brain is to produce behaviours, which are, first and foremost, movements. Several different regions of the cerebral cortex are involved in controlling the body's movements. These regions are organized into a hierarchy like the crew of a ship. On an ancient galley, for example, the captain determined the destination for a voyage by assessing the various factors that might make such a trip worthwhile. Then his lieutenants calculated the direction that the ship had to travel to reach that destination, based on weather conditions. Finally, the lieutenants transmitted their orders to the crew manning the oars, who used their muscles to move the ship in the desired direction. Similarly, in the human brain, planning for any given movement is done mainly in the forward portion of the frontal lobe. This part of the cortex receives information about the individual's current position from several other parts. Then, like the ship's captain, it issues its commands, to Area 6. Area 6 acts like the ship's lieutenants. It decides which set of muscles to contract to achieve the required movement, then issues the corresponding orders to the "rowers"the primary motor cortex, also known as Area 4. This area in turn activates specific muscles or groups of muscles via the motor neurons in the spinal cord. Even for a movement as simple as picking up a glass of water, one can scarcely imagine trying to consciously specify the sequence, force, amplitude, and speed of the contractions of every muscle concerned. And yet, if we are healthy, we all make such movements all the time without even thinking of them. The decision to pick up a glass of water is accompanied by increased electrical activity in the frontal region of the cortex. The neurons in the frontal cortex then send impulses down their axons to activate the motor cortex itself. Using the information supplied by the visual cortex, the motor cortex plans the ideal path for the hand to follow to reach the glass. The motor cortex then calls on other parts of the brain, such as the central grey nuclei and the cerebellum, which help to initiate and co-ordinate the activation of the muscles in sequence. The axons of the neurons of the primary motor cortex descend all the way into the spinal cord, where they make the final relay of information to the motor neurons of the spinal cord. These neurons are connected directly to the muscles and cause them to contract. Finally, by contracting and by thus pulling on the bones of the arm and hand, the muscles execute the movement that enables the glass to be picked up. In addition, to ensure that all of these movements are fast, precise, and co-ordinated, the nervous system must constantly receive sensory information from the outside world and use this information to adjust and correct the hand's trajectory. The nervous system achieves these adjustments chiefly by means of the cerebellum, which receives information about the positions in space of the joints and the body from the proprioceptors.